By most accounts, the Renault-Nissan partnership has been a success. After acquiring Mitsubishi in 2016 following a brute force takeover where Nissan snitched on Mitsubishi for fudging its fuel economy numbers and then bought a controlling stake in the company after its stock price had tanked, Renault-Nissan slid to the top of the list of world’s largest automakers by sales at the end of 2017 and is now running neck and neck with Toyota in the final quarter of 2018. Companies can rise to the top of their ranks for a number of reasons, but it usually has something to do with building high-quality products that customers love and that the competition strives to beat. Unfortunately, that hasn’t quite been the case for Nissan lately and, as we learned after borrowing a Deep Bordeaux Red Infiniti QX60 for a week, for its luxury subsidiary. Our main complaint, that Infiniti didn’t do enough to differentiate the QX60 from the Nissan Pathfinder on which it’s based, can be seen in many parts of the body, but nowhere is it as clear as on the exterior. While it does look striking and upscale thanks to ample amounts of chrome and a new grille, the familiar and barely-disguised shape of the Pathfinder can be seen at surface level. That wouldn’t be as much of a problem if the Pathfinder’s bulbous shape didn’t look like it was aimed at your average soccer mom or minivan enthusiasts, but at least Infiniti seems to have recognized its mistake because the automaker has added the Luxury trim to the lineup for 2019. 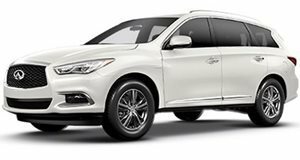 Characterized by darker exterior chrome trim and 20-inch wheels colored to match, the LUXURY trim (yes, in all caps) gives off a more premium feel, but like lipstick on a pig it’s not the leap away from awkwardness the QX60 needs to earn our love. If you think the exterior is the only part of this crossover that bears a strong resemblance to the Pathfinder, then you may want to look under the hood. There you’ll find the same 3.5-liter V6 mated to the same CVT sending 295 ponies and 270 lb-ft of torque to all four or just the fronts in FWD models. Output is up 11 horsepower and 11 lb-ft of torque over the Pathfinder, and that enables the QX60 to hit 60 mph from standstill in 7.1 seconds. Acceleration like that is far from poor, but it also means the QX60 is not the ride you want if passing power on the freeway is a priority. While the engine might not be turbocharged or feature special fuel-saving tactics like the variable compression ratio engine in the QX50, the QX60 relies on its CVT for to attain a combined 22 mpg (19 mpg city, 26 mpg highway) even if a week of aggressive driving in dense stop-and-go traffic nudged our tester’s average mileage closer to 12 mpg. 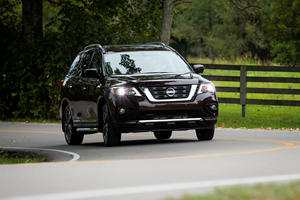 Interior & Features: More Than Just A Plush Pathfinder? One job the LUXURY package has is to cut down on similarities between the QX60's interior and the Pathfinder’s. It’s a crucial move for the QX60 given that parts both big and small—the gauges and buttons as well as the door handles, air conditioning vents, and the way the the buttons feel when pressed—convey an experience that's nearly identical to what the Pathfinder delivers. 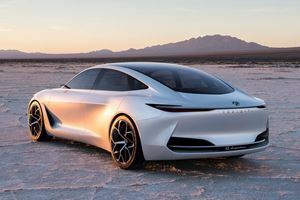 With hourglass shapes stitched into seats coated in gorgeous white semi-aniline leather with dark silver and wood accents strewn about the cabin, the inside of the LUXURY package is upscale enough to let one look past the dated look and unergonomic functionality of the cabin. But even if a driver should avert their eyes when driving by reflective surfaces that showcase the QX60’s porky body, the payoff comes in the form of huge amounts of interior space that’s enhanced by a large panoramic glass moonroof and the fact that the pretty hourglass-shaped leather makes it all the way to the third row seats. Sitting in the second or third rows, we could start to see where the QX60’s strong points lay. Those soccer mom-approved aesthetics translate to soccer mom-friendly utility, with both rows behind the driver’s seat able to be folded down using buttons in the trunk. Open the automatic tailgate and you’re greeted by an unimpressive 16 cubic feet of storage space when all rows are pointing to the sky. Stow the third row and suddenly there’s 40.5 cubic feet of storage, and once the second row is folded down the QX60 becomes a carrying vessel capable of holding 76.2 cubic feet of whatever you’d like it to hold. You pay for storage capacity of that nature through large exterior dimensions, with length, width, and height coming in at 200 inches, 77.2 inches, and 68.6 inches, respectively. Because of the QX60’s shape, expect the body to take up its full share of space on all sides, which make the grainy but still-useful 360-degree cameras something to be thankful for when parking. Sliding the slick and minimalist Nissan/Infiniti key fob into a pair of jeans and stepping inside the cabin brings the scent of leather to the nostrils and pleasant dings accent the sound of the engine just after pressing the start button. There’s nothing out of the ordinary to make note of until you move the gear selector into Drive and start rolling. On the upside, the CVT is one of the most forgivable we’ve driven (just like the Pathfinder’s) and avoids cuing up one long droning rev from the engine when taking off from a stoplight or even when climbing hills. You can uncover the drone by stepping on the throttle with more authority and trying to get to highway speeds from a rolling start, but by that point, you’ve already encountered the QX60’s more pressing issues. The main one is the suspension, which rides well over perfectly smooth roads until you realize that there’s hardly such a thing in America these days. On your average road, the suspension bears an uncanny resemblance to many Nissan crossovers by feeling uncomposed and riding harshly over bumps in a way that will rudely awaken anyone entranced by the LUXURY package’s interior fixings. Almost paradoxically, the QX60 also leans in the corners as a high center of gravity translates to body roll. It shouldn’t be this way, a soft suspension that sends the nose diving under semi-hard braking usually doesn’t deliver harsh bumps that disturb an otherwise quiet ride, but that’s the case here. The steering follows the same pattern, feeling heavier than in other luxury cars in this class but not having the added weight translate to a sense of connection with the road. Aside from the LUXURY package’s looks, the QX60 does give off the sense that it's packed full of high-class technology when the occupants get to play with its many toys. From heated seats in the first and second rows and the 15-speaker Bose sound system to the Proactive package with its suite of driver aids that function as well as the industry’s leaders in semi-autonomous tech, the QX60 seems to have an automated function for everything. While switching into Sport mode from the default Normal mode doesn’t do much to enhance performance, Eco mode encourages polite driving behavior by adding resistance to the throttle to give drivers a cue to go easy on it. The area in which the QX60 falls short when it comes to technology is on the 8-inch touchscreen infotainment system and the buttons that surround it. Not only are the buttons laid out in a confusing and unergonomic manner (like many other buttons in this cabin), but the system is slow, laggy, and unpleasant to interact with, feeling like it belongs in a car from the mid-2000s rather than 2019. One of the main things we took away from our week with the QX60 is that Infiniti still has some work to do in order to catch up to the competition, if that’s it’s aim in the first place. But another way to digest the QX60 is to see it as a budget alternative for those buyers who want the bling factor and all of the tech features without any of that cash going towards a badge. The QX60 starts at $45,245 including destination, undercutting competitors like the BMW X5 and Mercedes GLE while ranking alongside the Acura MDX in price despite having a two seat premium over the two German SUVs. Adding AWD or moving up from the PURE to the LUXE trim costs $1,800, and given that our test vehicle had both it got tagged with a base price of $47,850. Getting the price tag to hit our tester's $65,930 sticker involves adding the $5,000 LUXURY package, a $3,500 Sensory package that adds toys and materials guaranteed to dazzle the four of the five senses (unless you enjoy the taste of wood trim), the $3,400 Proactive Package filled with driver aids, shelling out an extra $2,150 for the Theater package, and finally checking off the box for the Essential package that includes navigation, Infiniti’s InTouch services, parking helpers like sonar and the 360-degree camera system, and adds $2,900 to the sticker. In the grand scheme of things, the QX60 is a crossover that delivers a luxury experience many will be satisfied with. 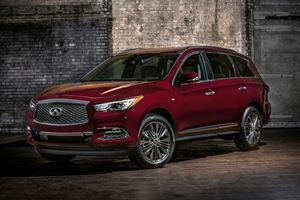 Using deep colors that resemble a glass of Napa wine and trims that make the interior a space that'll impress friends and clients, the QX60 lives up to its creed as the status symbol many of its buyers want it to be. But when the veneer starts to peel a few years down the line, expect sympathetic looks from Mercedes drivers. Company issues recall as a result. Nothing says fancy like dark wheels and contrast stitching.